How Can Animals Walk Upside Down? Home Other Articles Animals: How Can Animals Walk Upside Down? 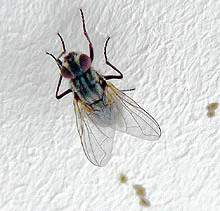 Performing a half-roll quicker than the eye can detect, a housefly lands upside down on the ceiling. As remarkable as the flip is the fact that the fly sticks there, and then nonchalantly walks about without falling off. The fly can defy gravity because of its feet. Between the two claws at the tip of each foot is a bladderlike structure covered with tiny hairs. Each hair secretes a glue that makes the “bladder” wet and sticky. In walking, the fly  which, like other insects, has six feet  picks up two legs on one side and one on the other, always leaving three legs firmly affixed. In a rather awkward scramble, tree frogs can move about while upside down, using the suction pad at the end of each toe. But even more unusual are the little warm-climate lizards called geckos, which have tiny hooks on the bottom of their feet. These catch on the most minute irregularities in a surface  even on a seemingly smooth pane of glass.